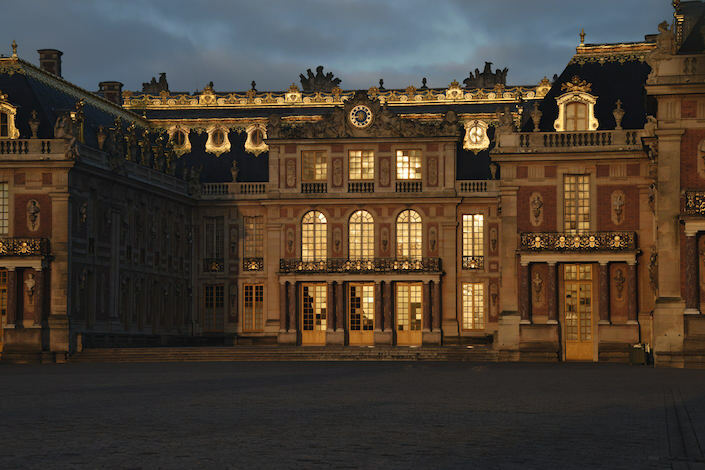 You’ve made the requisite pilgrimage to Versailles and seen the storied chateau, in all likelihood with throngs of others. The Hall of Mirrors was glorious, the magnificent gardens sublime but in truth, you saw only a small portion of the great and hidden splendors of the Sun King’s Palace. Now in a gorgeous oversize new volume, you can enjoy an unprecedented tour of the palace, behind the scenes with the four official palace photographers. 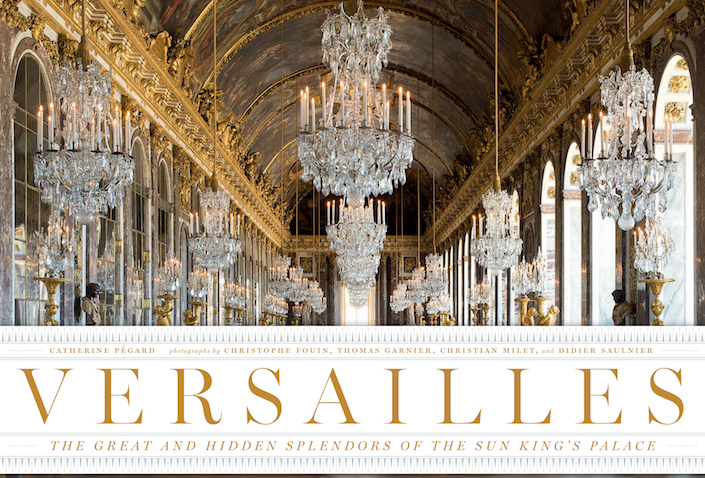 With an introductory preface by Catherine Pégard, president of the Château du Versailles’ supervisory board, the book not only celebrates the more well known public spaces but provides unparalleled access into the private chambers and apartments in the upper floors. 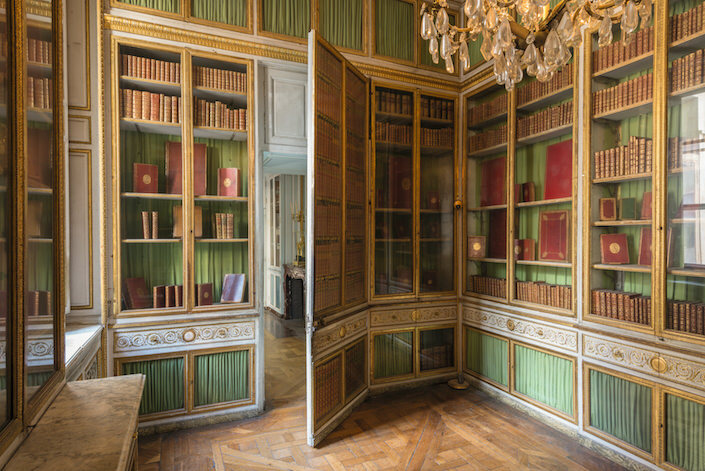 Below, Marie Antoinette’s library, with an intricately decorated jib door and bookcases displaying leather bound volumes embossed with her coat of arms. Opening their personal albums for the first time ever, the four photographers, Christophe Fouin, Thomas Garnier, Christian Miles and Dider Saulnier each look at the palace with a different eye. But if there is one aspect that has captured them all, it is the light. As Garnier explains, “I go hunting when the sun is as I like it. Before 10 am. After 4 pm.” Below, his ethereal shot of the château as seen from the Orangerie on a frosty winter morning. 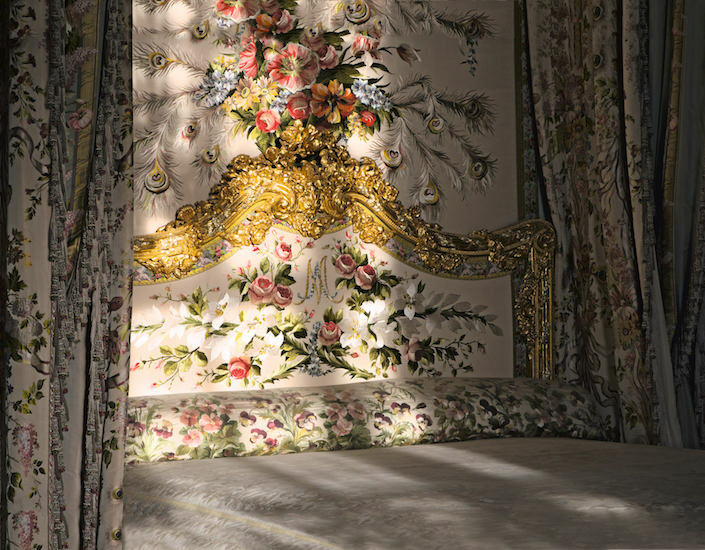 And below, he captured the light so delicately in the intimate quarters of the queen’s bedchamber, restored to how it would have been on October 6, 1789, when Marie-Antoinette fled Versailles, never to return. The room wears its summer decor emblazoned with the flowers the queen loved. It is the intimate knowledge of the palace, both grand spaces and the smallest details, that these photographers bring to the book, telling the story not often seen. 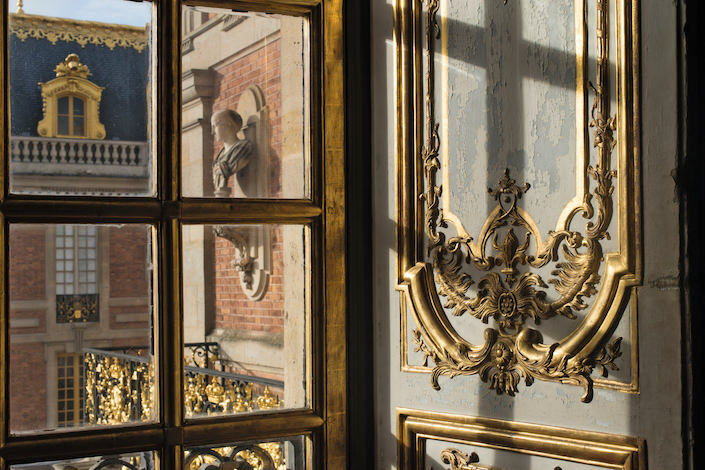 Within the King’s Inner Apartment is the Gold Plate Room, so named for the period when Louis XV displayed his gold-plated dishes there. The window in the room, below, overlooks the Royal Courtyard with the balcony on the right part of the king’s inner cabinet. It was from here he watched Madame de Pompadour’s funeral procession. The photograph almost seems to capture that wistful emotion. 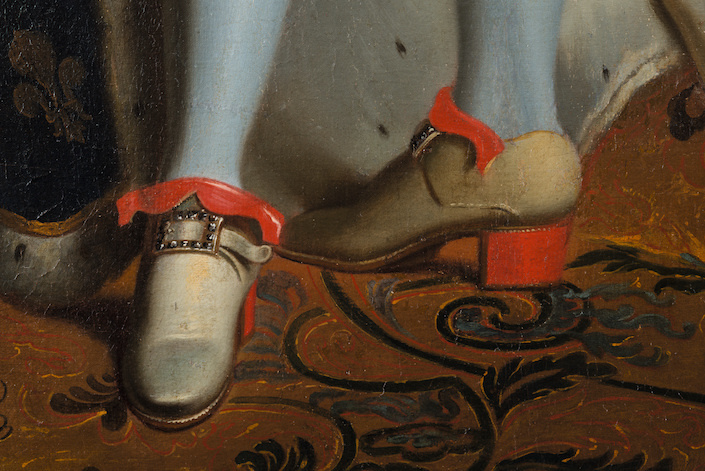 In the Bull’s-Eye Salon, a large room in the king’s antechamber, a detail in a portrait by Rigaud shows the king wearing shoes with red heels, a fashion statement inadvertently started by his brother who, after walking through the butcher’s district, arrived in the Council Study with blood stained heels – perhaps a story known by some contemporary shoe designers. It is impossible to appreciate many of the palace’s architectural features when filled with visitors. 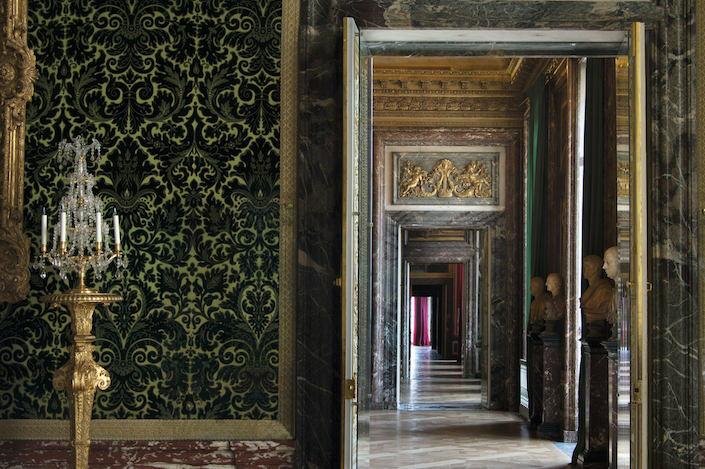 Below, the impressive enfilade of the Grand Apartments. Originally comprised of seven rooms with each dedicated to one of the then-known seven planets, the apartments were a metaphor for the Sun King. 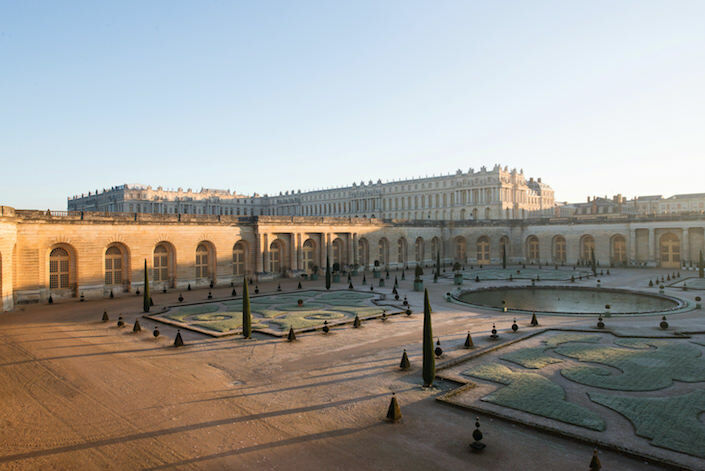 As the final photo explains, Versailles is the château where the sun never sets. This beautiful volume from Vendome not only features stunning photographs but is informative and exquisitely produced and printed – a must for any francophile or reader inspired by beauty, craftsmanship and history. This entry posted in architecture, art, art history, design, garden, history, interior design, photography, travel. Entry Tags: Architecture, Design Books, France, history, interior design, Versailles Bookmark the permalink. This is splendid, and a perfect book to consider on the heels of France’s Heritage Days this past weekend, when many off-limits spots open their doors to the public. During les Journées du Patrimoine years ago, I visited Hotel de la Marine on Place de la Concorde in Paris (where the guillotine was during the Revolution)–Marie Antoinette was held there before her execution, and the room was left intact. Next to the Palace of Versailles is the Trianon Palace, now part of the Waldorf hotel chain. I stayed there once and it was amazing. The Treaty of Versailles that ended WWI was signed there. Anyway, how much better to have a book of photos shot by professionals than a bunch of phone-camera snaps full of crowds. When visiting, enjoy the moment. Your article is so well written. I’m looking forward to this book. Thank you. I see that some of the cut velvet from the Gerald van der Kemp era is still extant. I thought it had all gone. Underneath it is the original wall decor, probably in need of refurbishment. That flocked look fabric used to be everywhere for a while, and the last of it will not be missed, as it is totally inappropriate. As far as the gold plate room: in European countries, plate means silver and gold items – solid silver and gold. To Americans, it means a thin layer covering another metal. Louis’s plate would have been solid, and he had a lot of it. In fact, many pieces of furniture at Versailles were solid silver. Chandeliers were solid sterling, as well as tables. Almost none of it is extant, as it was melted down to pay for military campaigns. The Danish and English royal families still have solid silver tables, and are loaning them to Versailles for an exhibition. Perfect timing! I’m headed there next week…what a challenge to try and top these 4 photographers. Such a gorgeous book. Wow! It feels like I was sent back to the old times! I’ve added this to my wish list. Thanks! When is the exhibition due as I will be visiting in the spring of 2018? when i visited, one of my goals was to see M.A.’s private rooms behind her state bedroom. i was told that tour was only viven at soecial times and not that day. disappointed, i went outside to the forecourt, when the ticket woman came running after me and said unbelievably, they wee giving the tour today and run back and get a ticket. M.A. was lookin out for me that day. the tour was one of the most amazing i’ve ever had. i remember every detail.